The veteran journalist was in the Taoiseach’s constituency of Mayo – however, Enda Kenny did not make an appearance. LAST NIGHT, TV3 aired the last People’s Debate with Vincent Browne in Taoiseach Enda Kenny’s constituency of Mayo. The debate was the largest held so far, with over 1,100 people attending the Mayo Convention Centre at the TF Royal Hotel in Castlebar. Last night’s show was the 40th and final show in the series and is a real testament to public service broadcasting, holding politicians to account in front of their constituents, with no air-brushing. Perhaps this ‘warts and all’ style of broadcasting, where politicians cannot avoid the difficult questions from the people, resulted in many politicians refusing to attend the debates. Despite being interviewed by the veteran journalist in the past when they were in opposition, politicians that have avoided the show include Enda Kenny, Joan Burton, Gerry Adams and Leo Varadkar. Fine Gael was represented at last night’s debate by local TD Michelle Mulherin. Neither of the other constituency’s TDs – Enda Kenny or Michael Ring – attended. Vincent said Mulherin was deserving of an applause from the audience for being the only government representative to turn up to the show. Senator Mary Louise O’Donnell, who was nominated to the Seanad by the Taoiseach Enda Kenny in 2011, defended his record at the live debate. However, it did not go down well with some. The shows has had some interesting moments over the last few months. Last September, filming was interrupted when gardaí were called to deal with jeering audience members. The pre-recorded Dublin Bay North People’s Debate programme was cut off after a woman claimed she had been threatened by a male audience member for applauding equality minister Áodhan Ó Riordáin, according to witnesses. A video posted online by anti-austerity group Dublin Says No shows insults being hurled by several audience members. Or who could forget the moment when Vincent compared two TDs to Podge and Rodge. There were also many inspirational speakers throughout the 40 shows, such as Jackie Crowe, a 49-year-old mother of two from Tralee, Co Kerry, who was diagnosed with Neuroendocrine Tumors (NETS), a rare form of cancer, just five months after falling behind on both her mortgage and her life assurance policy. She opened up to TV3 in an effort to warn others of the seriousness of falling into arrears on your life assurance policy. The total arrears that saw her policy void amounted to just €244. There was a lot support for Vincent for not shying away from the key issues and questions. Vincent closed the show by thanking all the staff who helped bring the show to fruition over the last few months, including the make-up artist, who he says does a great job of making him look presentable every week. 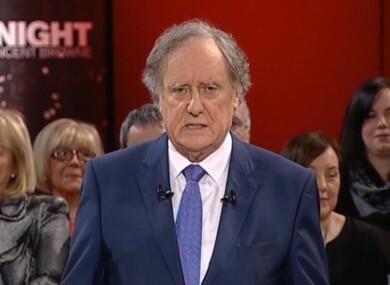 In a tribute the Vincent Browne completing the mammoth task of travelling around the country for the 40 shows, TV3 has put together this tribute to the man who asks the tough questions. Email “Vincent Browne's People's Debate wraps up after mammoth 40 shows ”. Feedback on “Vincent Browne's People's Debate wraps up after mammoth 40 shows ”.